I just love Sesame Chicken. I know it’s an Americanized dish through and through but for me, it’s still what I usually order if I go Chinese. I have an old recipe on a faded recipe card that I’ve made once; loved it but it’s simply not something I want to go to the trouble of making often. Or ever. I think the best version of Sesame Chicken to eat at home comes via delivery from a nearby Pho restaurant. I’ve tried Pho there but I just could not get onboard with the craze; so I go there for the chicken. It’s not that it’s seriously difficult to prepare but the whole notion of frying chicken always feels like too much work. Not so much in the preparation and actual frying but the cleanup. No matter how careful I am; that oil seems to spatter into every crevice possible and the cleanup just leaves me wondering WHY I ever FRY? Takeout it is…until now. So how about trying it without the frying? 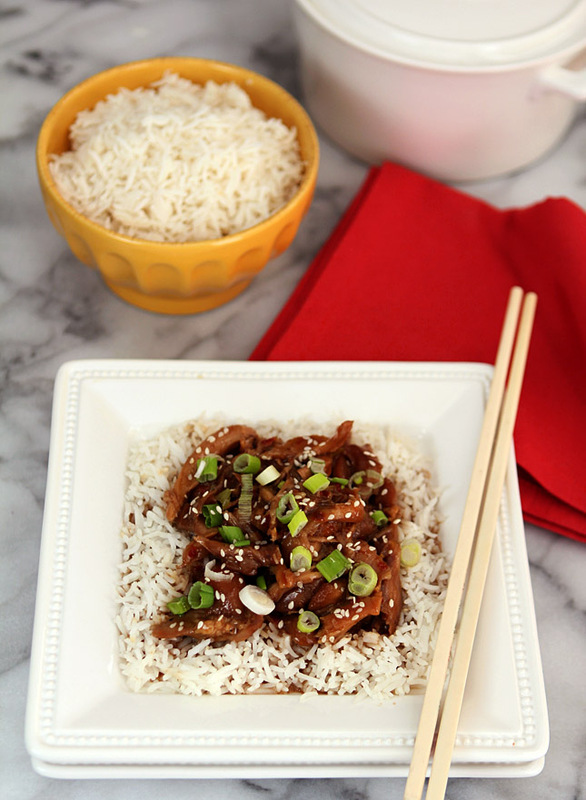 Now don’t get me wrong; I just love the crunch factor of Sesame Chicken but I decided that I could try doing without the crunch if it meant having those flavors I love come together easier at home and what could be easier than making it in a crockpot? I’m certain anyone reading this blog will understand that thinking; eliminating some extra fat and calories is just a bonus! There are times and places for all day cooking but without this crockpot recipe I just know I will spend my time and money making that run to Pho! It passed muster with my troops; they loved the flavors and insisted it was delish. That’s all I EVER ask for; I love me some happy eaters! Let me know if this works for you too! Season chicken with salt and pepper and put into crockpot. Combine onion, garlic, honey, brown sugar, ketchup, soy sauce, oil, rice wine vinegar and chili paste in a small bowl; mix well. Pour over chicken. Cook on low for 3-4 hours. Remove the chicken leaving the sauce in the crockpot. Cool chicken slightly and shred into bite size pieces. Dissolve 4 teaspoons cornstarch in 1/3 cup water in a separate small bowl and add mixture to crock pot; stirring to combine with sauce. Cover and cook until slightly thickened; 5-10 minutes. Add chicken back to sauce and stir to coat. Plate rice on dishes and top with chicken. 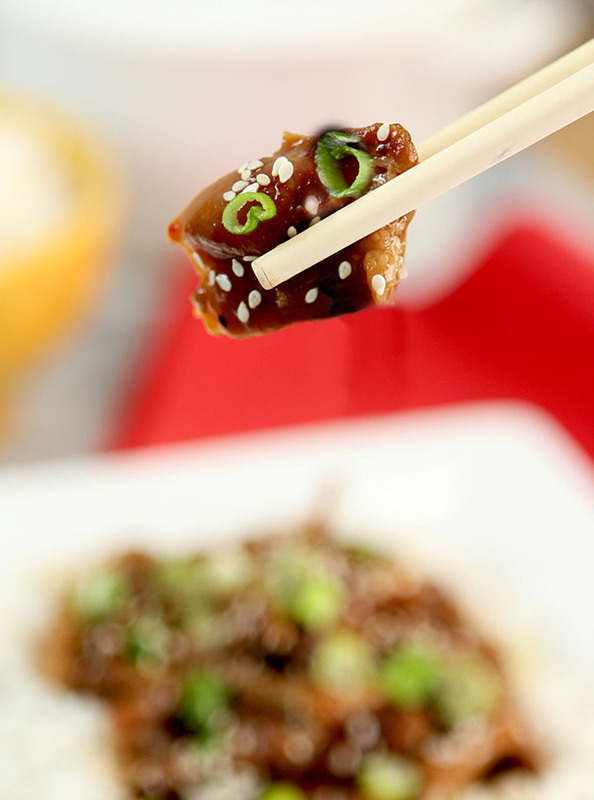 Garnish with sesame seeds and green onion slices. Depending on your crockpot's age and settings; you might have to pour the sauce into a saucepan and thicken in on the stove. Return sauce and chicken to the crockpot to keep warm for serving. I absolutely have to make this. Sesame Chicken is my favorite crappy Chinese takeout but it’s sooo bad for you! This is easy and flavorful and we love it Maris. Miss the crunch a bit but that’s where the calories are so I don’t miss it THAT bad! Love your site. Always looking for crockpot ideas. 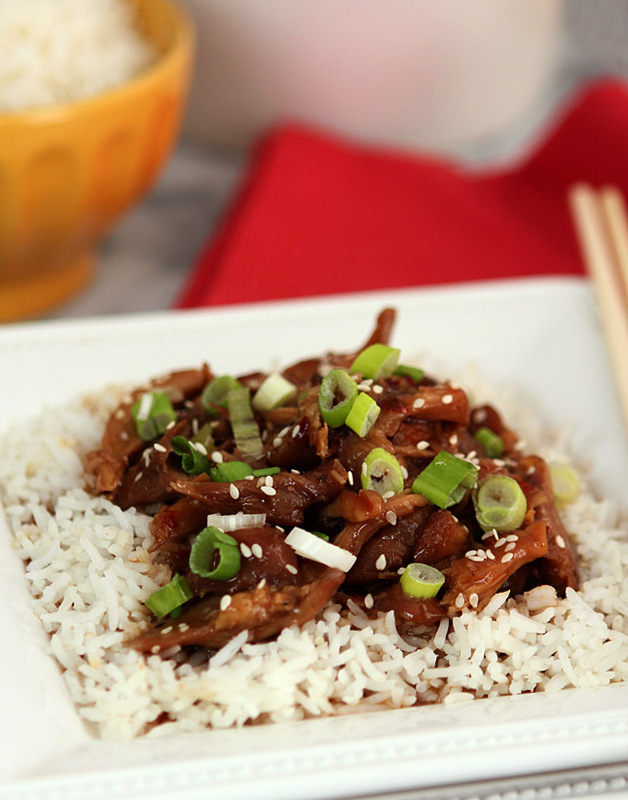 The crockpot sesame chicken sounds wonderful. Pinned it. Need a new cookbook too! Funny, I love chicken and I love rice but I’ve never had Sesame Chicken! Now that you’ve shared this wonderful looking dish via the crockpot method I’m going to give it a go. Just have to bring my crockpot up from the downstairs pantry. I am not a fan of frying either, Barb, and this version of Sesame Chicken you made in the crockpot is ideal. I think our crockpot is going to be spending the winter on our counter I’ve been using it so much! Thank you for sharing such an inspiring dish – I’ll be making it soon. And making your eaters happy is indeed a pleasure! My crock-pot fell out of favor like it did for many when the only settings were On or Off but with a newer one I’m loving it again. Making caramelized onions today; I could eat them on anything! caramelized onions in a crockpot? This sounds like a winner! Adding to my to-do list as the current “fry it” recipe I have is too much work. Love shortcuts and slow cookers. Thanks for posting. I was in the same boat Nancy; everything about this is so much easier and as a bonus certainly healthier too. I just got a new slow cooker because I killed my last one. 😉 I’m trying to learn more Asian dishes, so I will have to give this a try. You’ll love the new one I bet. I used my friends and it must be 30 yrs old. Low or High and no timer. Yes, I’m a bit spoiled I guess but multi talking requires some of those features right? Right now I’m suddenly craving a bacon scone!! OK, I pinned this for when I get my hands on some chicken (I’m oddly out of “normal” meat). It’s just about 11 p.m. and I want some of this NOW! I chuckled but me too! I’ve got some antelope, some grass feed beef (special stuff), some locally made Italian sausage. Time to shop! A couple of folks on Twitter have already made it and loved it too. Way too easy! Yum!!!!!! I’m with you Barb – I always think twice before frying something.. the cleanup is just NOT worth it! This sounds like the perfect solution to me… and as such it’s going onto the “must make soon” list!!! I have a little deep fryer even but even if I can control the splatter, the little deep fryer does not translate to little work on cleanup. I knew everyone would get it! Oh girl, I’m thinking this is tonight’s dinner! If you did make it for dinner you weren’t alone; I heard from several tweeps that made it today…loved that they loved it too! Love the crockpot version. A great alternative to frying. Pinning! Thanks Norma; we did love it! Interesting crockpot version of this recipe, Barbara. Just wondering, do you use a wok? I don’t have a wok Lizzy but my daughter does and I’m eyeing it; I don’t think she wants to move with it but once she heard me say I would love it she’s decided she might want to keep it. Kids!! I loved working with it when I made fried rice; I might just have to pop for one. Right now if I fry I have to dray out a small deep fryer. Love this alternative to frying. There is a dish at PF Chang’s that I LOVE but then I asked once about the recipe and it was not just fried once, but twice!! Yup it is tasty but the way you made this chicken dish looks much easier, healthier and I bet it tastes even better! Thanks, Barb for sharing. Oh wow…double the fat; bet it was good! I think next time I’m going to try adding some Chinese noodles and see if that satisfies the expected crunch; because this is so easy and so good; the only way I’ll ever make it at home. Good idea to update this dish for the crockpot. I do fry from time to time, but like you always wonder why – is the cleanup really worth it? I like this dish but have never made it – definitely need to give this a try. Thanks. One of the BEST things I’ve ever had come from the deep fryer were at my daughter’s insistence. Packaged biscuit dough wrapped around a Hershey’s kiss and then deep fried. So basic, so packaged products and SO good. I might suffer through cleanup for that! I love sesame chicken too, but rarely make or order it because of the obvious. Thanks for this recipe Barb, looks like I might be able to enjoy it again. Gorgeous, mouthwatering photos. Thanks a bunch but forget me; I’m still just so excited for you. I can now add to my list of achievements that I know someone who was a winner in the Pillsbury Bakeoff! I’ve never had sesame chicken before but I like the sound of this! Who needs frying? I too hate frying mess and will hardly ever fry to avoid the clear up afterwards! Love hearing I’m not alone. When I bought that little deep fat fryer I apparently wasn’t thinking beyond those donuts I wanted to make. That I now bake! I’m with you Barb, anything that retains the flavour, but makes the prep, cooking and clean-up easier is perfect by me. this sounds lovely. I friend some chicken recently for an Indian dish that specifies peanut oil. On top of all else; that stuff is pricey! I should try revising it for the oven next huh?